When it comes to learning people to code, efforts have to start at a very young age. As we humans grow older, we become less keen on learning new things. Especially coding is an odd creature in that regard, as it is one of the more difficult things to learn at a later age. Fisher Price has come up with a bright solution to stimulate young children in learning to code. Also read: Sweden to go Cashless, Hope for Bitcoin? Learning young children the benefits of coding and developing will go a long way in creating more IT-oriented adults in a few years from now. As our society evolves into a more digital state of mind, the need for IT professionals is growing. Universities and schools can’t keep up with the growing demand, and the only solution is to stimulate the appeal of coding at a very young age. 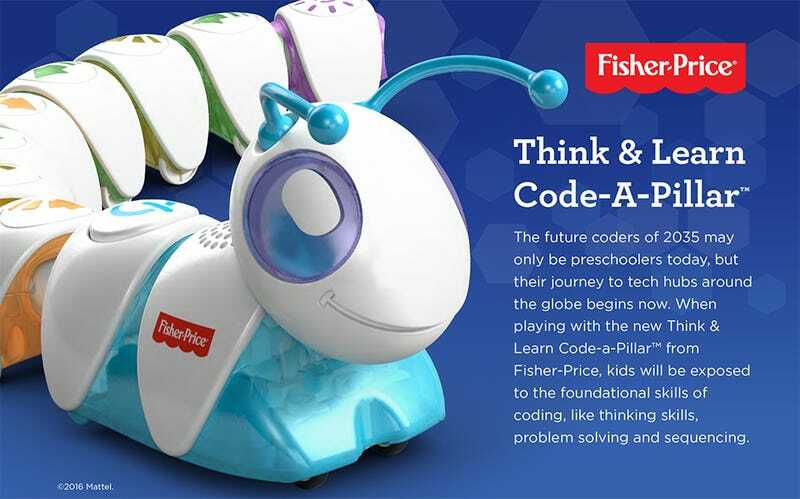 Fisher Price has announced a new line of toys which will teach children in kindergarten the necessary tools to facilitate coding at a later age. By uniting different modules of the toys in question, they can achieve different results. As a result, they will start to wonder how all of the modules are connected, and why things respond differently in certain scenarios. While these efforts may seem to do nothing for coding right now, Fisher Price aims to stimulate that part of the brain where children grow an interest in figuring out how things work. Society has evolved into a creature of convenience, where children are no longer challenged to figure out how something works, or why it follows a certain set of rules. Mechanical operations and software conditions should never be taken for granted, as there is a wondrous world waiting to be discovered. Fisher Price acknowledges parents should bear part of the responsibility of stimulating their children, which is why the company has created a companion smartphone app. By using this application, parents can get new suggestions regarding how to best challenge their children, as they gain a better understanding of how things work. Using animals in the form of a coding toy is a smart move by Fisher Price, as it does not alienate children from giving the concept a try. Considering how this toy will cost US$50 at launch, there is no reason not to buy this for children. They are, after all, the future of our society, and we need to give them every chance possible to make it in the real world. Impact on Bitcoin Coding Down The Line? It’s not just the traditional business world that will need more coders in the future, but the Bitcoin and blockchain ecosystem can use some fresh blood as well. As both of these technologies are being embraced by people all over the world, more people can make an impact on the daily lives of others by actively being a coder in the Bitcoin world. Companies from all over the world are starting to hire Bitcoin and blockchain professionals who can use the technology to suit the needs of particular business models. Growing an interest in coding at an early age will be beneficial to this industry as we will need every pair of helping hands in the future. What are your thoughts on initiatives like the one by Fisher Price? Should we stimulate children to code at a very young age/ Let us know in the comments below! The post Fisher Price Will Create Future Generations Of Bitcoin Developers appeared first on Bitcoinist.net.